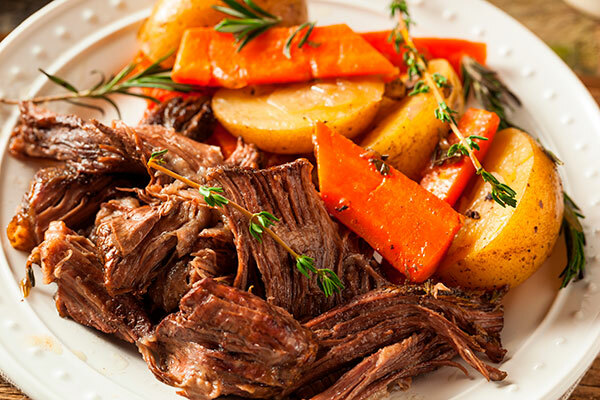 There’s something so comforting about gluten free pot roast on a cold Winter night. As a mom that’s often on-the-go, I also love making it for busy weeknights any time of year. The fact that I can “fix it and forget it” in under 20 minutes is a major bonus, since it allows me to work on other things or play with my kids while it cooks. I often cook it in a slow cooker, but this time I cooked it in the oven on low and it was amazing. So naturally, I had to share the recipe with all of you. 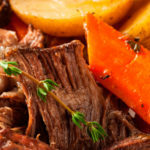 This gluten free pot roast recipe is gluten free, dairy free, egg free, soy free, and nut free. It’s a delicious one pot meal that is always a hit in our house from the littlest eaters to the grown ups. It makes great leftovers too, and I often send it in lunch boxes the next day. Just add it to a pre-heated thermos, and it will stay warm for hours. A fix it and forget it recipe for a comfort food classic. Add olive oil to large dutch oven pot on stove top and turn it to medium-high heat. Cover the meat with salt and pepper and sprinkle a 1/2 teaspoon of paprika on each side. Add the meat to the pot and sear it on both sides until it's a light brown. This will take 3-5 minutes per side. While the meat is searing, chop your vegetables. Potatoes should be cut into cubes, carrots should be peeled and cut into large chunks about 2 inches long, and onion should be quartered twice. Once seared, remove the meat and add 1 cup of beef broth and bring to a boil. This will deglaze the pan. Turn off the stove and remove the pot from the heat. Add the meat back into the pot, and add the vegetables. Pour the rest of the beef broth into the pot. Cover and place it in the oven for 4 hours.